To add a failover domain, follow the steps in this section. Click Add. Clicking Add causes the display of the Add Failover Domain to Cluster dialog box, as shown in Figure 4.8, “luci failover domain configuration dialog box”. In the Add Failover Domain to Cluster dialog box, specify a failover domain name at the Name text box. To enable setting failover priority of the members in the failover domain, click the Prioritized check box. With Prioritized checked, you can set the priority value, Priority, for each node selected as members of the failover domain. To restrict failover to members in this failover domain, click the Restricted check box. With Restricted checked, services assigned to this failover domain fail over only to nodes in this failover domain. To specify that a node does not fail back in this failover domain, click the No Failback check box. With No Failback checked, if a service fails over from a preferred node, the service does not fail back to the original node once it has recovered. Configure members for this failover domain. 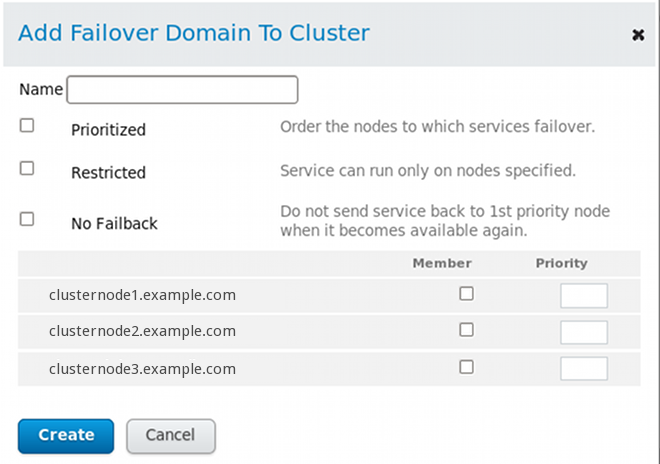 Click the Member check box for each node that is to be a member of the failover domain. If Prioritized is checked, set the priority in the Priority text box for each member of the failover domain. Click Create. This displays the Failover Domains page with the newly-created failover domain displayed. A message indicates that the new domain is being created. Refresh the page for an updated status.